Often the problem with being a gourmand in the City of Gold is that the Western Cape remains South Africa’s food capital. 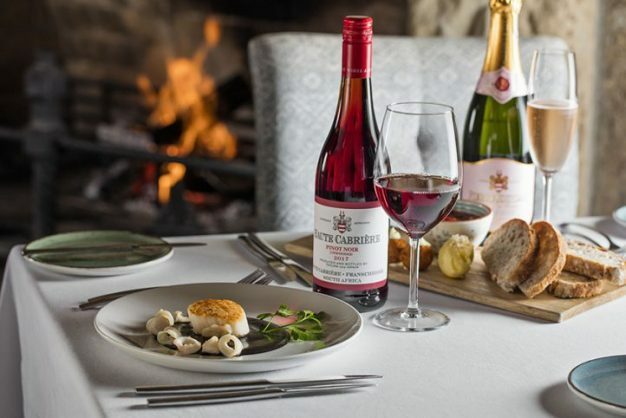 During the summer months, however, Western Cape restaurants are overrun with tourists and all those basking in the beauty of Cape Town and the dining pleasures of the winelands. For South Africans not living in Cape Town, winter is the best time to visit as there’s more value for your rand and less visitors clogging up the main points of interest. The problem is, more often than not, that the top restaurants are on winter break to allow staff to rest and chefs to come up with new menus and new ways to stun diners next season. It’s a catch-22. 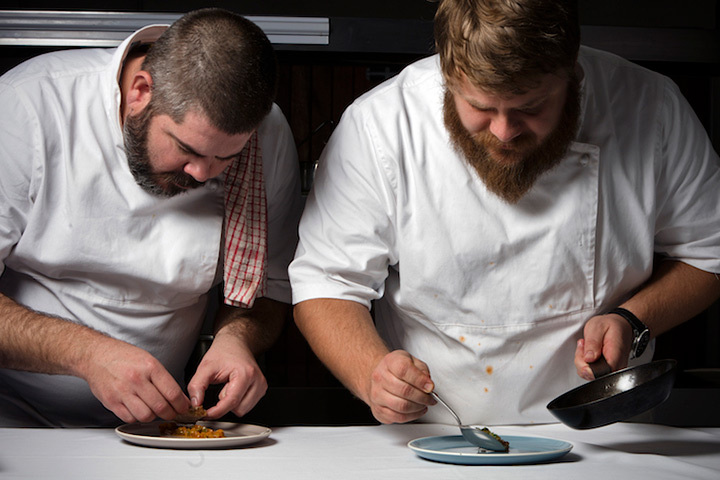 While you want chefs to come up with new ideas, the break means sometimes you miss out on divine experiences unless you’re brave enough for the maelstrom of a Western Cape summer. That is changing. 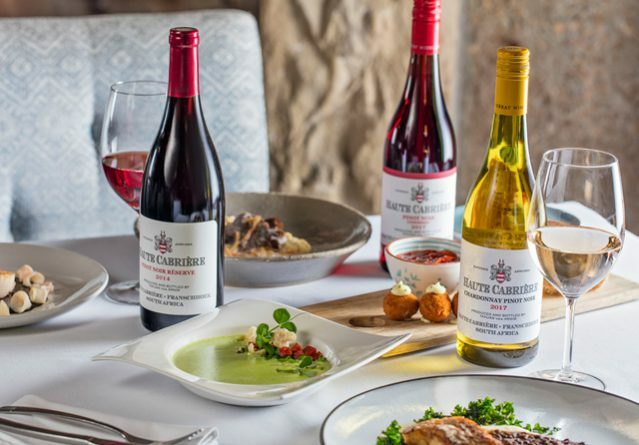 For the second year, Haute Cabrière chefs Nic van Wyk and Westley Muller are forgoing their time off to present Haute Cabrière pop-up restaurants in Johannesburg, Pretoria, Durban and the Garden Route. During a preview of the six-course menu last week it’s clear that they are bringing elevated dining inland and not just an ersatz exercise as so often happens at pop-ups. 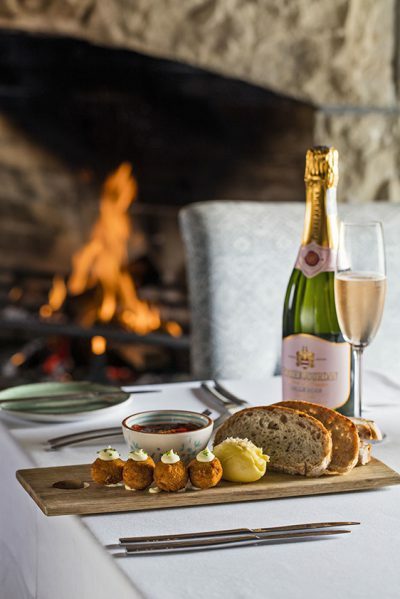 Their food is expertly paired with Pierre Jourdan and Haute Cabrière and focused on providing you with heartily decadent food that warms the chill in your bones. So what can you expect? It starts with whole wheat ciabatta, bocconcini cheese croquettes with smoked aioli and quince jam paired with the sharp sparkle of Pierre Jourdan Belle Rose. It’s traditional but comforting. Next Van Wyk presents a new take on pea and ham soup in the form of a creamy pea soup with chorizo and pork puffs. The rich soup is paired with Haute Cabrière Chardonnay Pinot Noir providing winter comfort paired with the crispness of a fruity wine. The next course is pan-fried Patagonia calamari with black tomato sauce (thanks to a dash of squid ink) and seared scallop. 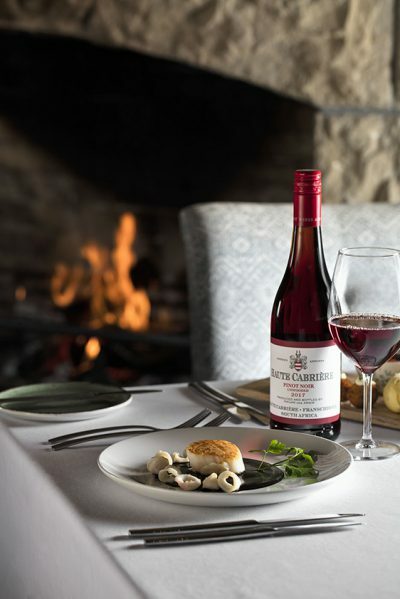 The dish’s acidic undertones and the freshness of the scallop is paired with the somewhat acidic Haute Cabrière Pinot Noir Unwooded that is surprisingly warming. Next up is a butter and thyme basted line fish with a silky cauliflower purée, red wine braised lentils and crispy kale. The creamy dish with tender fish is washed down with Pierre Jourdan Tranquille. Its dryness sensually layers the crisp kale, creamy puree and the tender fish. The last part of the main meal is a creamy rosemary and bay leaf venison ragout with soft Parmesan polenta and a bone marrow foam. Paired with Haute Cabrière Pinot Noir Reserve it’s the star dish with expert combinations. The menu ends with a chocolate torte with amaretti crumbs, candied pecan nuts and salted caramel popcorn, paired with Pierre Jourdan Ratafia. The dessert wine remains a standout product of the Pierre Jourdan range. It’s a satisfying drink to sip regardless of weather, time of day or personal preference. Haute Cabrière’s food and wine philosophy centres around harmony and balance. Second generation cellar master, Takuan von Arnim, aspires to produce well-balanced wines from Chardonnay and Pinot Noir, while still honouring the unique characteristics of these noble grape varietals. This philosophy shines through during the dining experience and, at R595 per person, you will miss out if you don’t book immediately. • Experience the menu at Randpark Golf Club from July 23 to 27. Book at facilitator@randpark.co.za or 011-215-600. • The Peech Boutique Hotel from July 31 to August 4. Book at events@thepeech.co.za or 011-537-9797. • Bryanston Country Club on August 17 and 18. Book at reception@bryanstoncc.co.za or 011-706-1361. • Moonshot Cafe, Menlyn, from August 21-24. Book at info@moonshotcafe.co.za or 072-349-9569.